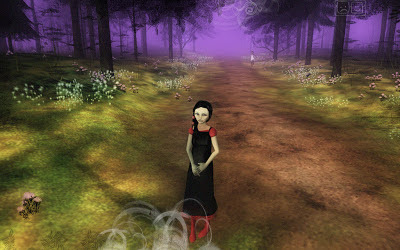 Tale of Tales is one of the first developers brought up in conversations about "art games." Many of their titles are more like interactive stories than games, per se. But the pretentious arty person I am, I'd argue interactive stories are games. Anyway, Tale of Tales is known for titles like The Endless Forest, a massively-multiplayer game where you don't really do anything except walk around a forest as a deer, and dance around with other deer. They also made The Graveyard, a short game about an old lady... walking through a graveyard. That's the whole game. Their newest title, Bientôt l'été, is an asymmetrical multiplayer game about playing chess and drinking wine with anonymous strangers. But Tale of Tales' most influential work is The Path. It's a psychological horror game based on the more grim (or Grimm?) side of fairy tales, and Little Red Riding Hood in particular. The player walks through the woods to Grandmother's house, and experiences some pretty creepy stuff along the way. Despite lacking any overt "scares", The Path is more creepy than almost any horror game on the market today. It's only $10, so you should download it.